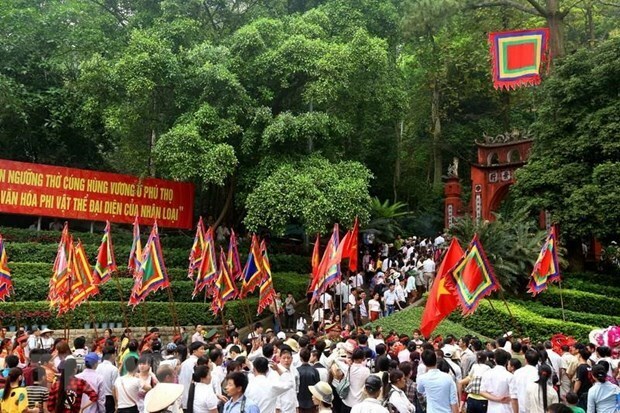 Phu Tho (VNA) – Communes, wards, and towns in Viet Tri city and surrounding districts in the northern midland province of Phu Tho held a kieu (palanquin) procession on April 12 as part of the Hung Kings Temple Festival. The palanquins were carried from seven different localities – namely Chu Hoa, Hung Lo, Kim Duc, Van Phu, and Hy Cuong in Viet Tri city, and Tien Kien and Hung Son in Lam Thao district – to the Hung King Temple. This ritual has been maintained for thousands of years by the local people. The same day, 14 teams, comprised of 13 from cities and districts in Phu Tho, and one from the northern province of Hai Duong, competed in a chung and giay cake-making contest. The winning team will make the chung and giay cakes as offerings to the Hung Kings, the legendary founders of the nation, on their death anniversary on the tenth day of the third lunar month.